An excellent conceited tragedie of Romeo and Iuliet. Title: An excellent conceited tragedie of Romeo and Iuliet. As it hath been often (with great applause) plaid publiquely, by the Right Honourable the L. of Hunsdon his seruants. Date: London: printed by Iohn Danter [and Edward Allde], 1597. An excellent conceited tragedie of Romeo and Iuliet. As it hath been often (with great applause) plaid publiquely, by the Right Honourable the L. of Hunsdon his seruants. London: printed by Iohn Danter [and Edward Allde], 1597. Romeo and Juliet was one of Shakespeare’s most popular plays from the moment it was first performed and printed. 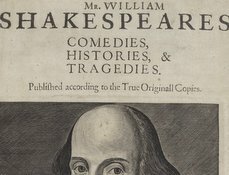 The first edition appeared in print in 1597 as “AN EXCELLENT conceited Tragedie.” The term “conceited” points to the witty, rhetorical language that pervades the play—language that exemplified the “sweet” style that Shakespeare was already known for, due to the sensational popularity of his earlier narrative poetry. 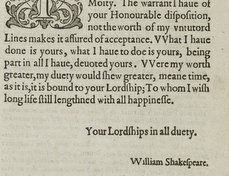 The sonnet shared by Romeo and Juliet at their first meeting, in which their playful banter with the religious language of pilgrims and saints leads to a kiss, was adapted both by John Weever in a sonnet dedicated to Shakespeare, and by the compiler of The Passionate Pilgrim. John Danter published the first quarto, and although his name appears in the imprint, he printed only the first four sheets. In a practice typical of the book trade, Danter shared the printing with Edward Allde, who printed the final six sheets of the play, as evidenced by the varying sizes of type and additional lines on each of the pages printed by Allde. 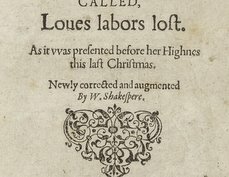 The first edition may have been printed early in 1597, since the title page refers to Shakespeare’s company as the servants of Lord Hunsdon, an affiliation the company only held from late 1596 into the next year. Danter’s press was also raided by the authorities in 1597, and although the trouble was over an unrelated offense, the episode has cast a shadow over Danter’s reputation, and thus of the books he produced. The first edition of Romeo and Juliet is over one-fifth shorter than the second edition, and possesses significant linguistic and theatrical differences; it was thus once classified as a “bad quarto.” Now, however, the first edition is considered a typical product of the market in popular pamphlets, a market in which Danter specialized. Scholars examine the edition for the potential insight it provides into the theatrical practice of Shakespeare’s company. The copy shown above was once owned by the Shakespearean actor David Garrick, who bequeathed it to the British Museum upon his death in 1779. 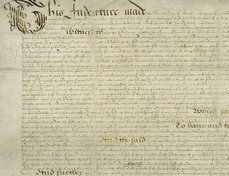 This copy became part of the British Library's collections under the 1972 British Library Act, and is one of five known to exist according to the English Short Title Catalogue. Garrick’s gilded coat of arms is tooled into the front and back cover of the binding. Harry R. Hoppe, The Bad Quarto of Romeo and Juliet: A Bibliographical and Textual Study (Ithaca: Cornell University Press, 1948). William Shakespeare, The First Quarto of Romeo and Juliet, ed. Lukas Erne, The New Cambridge Shakespeare: The Early Quartos (Cambridge: Cambridge University Press, 2007).